Each week-long pottery course starts with a meal on Friday or Saturday evening, depending on our starting day, when we get to know each other and introduce the course. 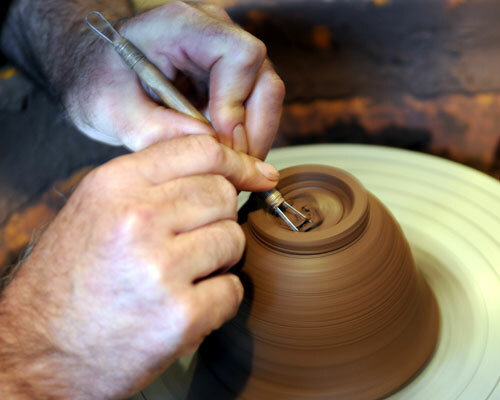 Then we have a daily programme with pottery tuition in the morning and an optional range of activities in the afternoon. For some, the afternoon is a time to continue their potting and the workshops are open from 9.30 a.m. to 10.00 p.m. (non residential to 6.00pm) Others prefer to have a holiday or to do some of the other activities on offer. The morning's tuition is divided into two parts by a coffee break. One half is throwing tuition and the other deals with handmade pots, decorative techniques and other aspects which the student may require. The week's course will finish with a Raku kiln so we usually start by making pots which will be fired in this way. For most students this is their opportunity to experiment with glazes and to see their pots being completed in the kiln. Its an exciting process which certainly gives original results.